September 28, 1972. One of the most memorable dates in Canadian hockey history. Team Canada defeats the Soviet Union in the now legendary "Summit Series", a result that would lead to dramatic changes in the way we viewed and played the game. While most of us can think back to exactly where we were when Paul Henderson scored "The Goal", one York Memorial alumnus would definitely not have a problem recalling where he stood for the historic moment! Harry Sinden was behind the Canadian bench as head coach of Team Canada 1972. And despite his success on that day and his many triumphs with the Boston Bruins, Mr. Sinden had no hesitation in recalling his days at Y.M.C.I. as "the best years of his life"! Harry grew up in a house on Bicknell Avenue directly across from a park that is now the site of cybridge @ George Harvey C. I.. It was on the outdoor rink in this very park that a young Harry honed his skills, as he did not participate in any form of organized hockey until he was thirteen years old. The rink was the focal point of the community for young boys who would play on the natural ice until the lights were turned off at 10:00 sharp each night. With only one boarded rink for hockey players, the space was severely limited and would often see as many as five or six games taking place simultaneously on the same pad. Harry attended Silverthorn Public School as a boy and did well enough to skip a grade, landing him at York Memo as a brash young thirteen year-old in the fall of 1945. High schools did not compete in hockey at the time, due to the unpredictability of the weather on the natural ice outdoor rinks. In fact, the present site of Keelesdale Park and arena was nothing more than trees and the neighbourhood swimming hole. It was at this point, however, that Harry began to take hockey a little more serious, playing for the first time in the city wide Toronto Hockey League. While at York Memo, he did participate actively in sports including football, basketball and track. While possessing a lot of heart, Harry admits he was not "the fleetest afoot" and claims to have been lapped in an 880 yard dash in the city finals. Two staff members in particular stand out in his memory: the Principal during that era, Mr. J.W. Ansley and a favourite teacher was the legendary Doug Barbour. Mr. Barbour was instrumental in the development and support of many of the York Memo athletic programs and later went on to become its Principal. Outside of sports, there were not a lot of activities to occupy a young man's time. Harry recalls losing on more than one occasion at an illegal black jack game held in the basement of a neighbourhood variety store that also served as the areas unofficial "off track betting parlour". A part time job on Saturdays helping the local Silverwoods milkman was the source of his limited budget at the time. While at school, Harry maintained a straight "A" average and vividly recalls having to present an oral essay in front of his peers in which he spoke on the "Canadian beaver". Perhaps his patriotism at the time was an omen of great things to come. After leaving York Memo in 1949 to play junior hockey in Oshawa, Harry eventually moved on to a minor pro career that would see him win a "world championship" in 1958 as a member of the famed Whitby Dunlops. After his playing days had ended in 1965-66 as a player/coach with the Central Leagues Oklahoma City Bruins, he moved up to coach the NHL's Boston Bruins. 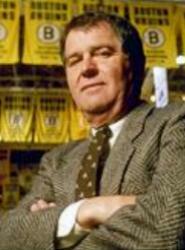 With such legendary stars as Bobby Orr and Phil Esposito, he led a young Bruins team to the Stanley Cup in 1969-70. A member of the Hockey Hall of Fame, the IIHF Hall of Fame, and winner of the prestigious Lester Patrick Award, Harry presently holds the position of Club President with the Bruins. Residing in nearby Winchester, Mass. with his wife Eleanor, the proud couple are parents to four daughters and numerous grandchildren.